It looks like Shazam! has just found its newest cast member. 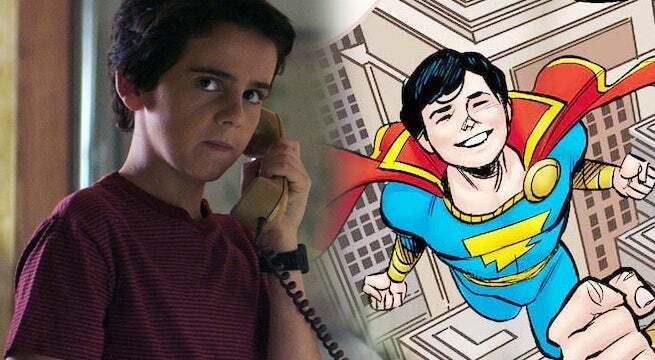 Jack Dylan Grazer is reportedly joining New Line's DC Comics film, according to Deadline. Grazer will play Freddy Freeman, who is described as the "best friend" of Billy Batson (Asher Angel) and "the only person who knows the truth" about Billy's adult alter-ego. Grazer has experience with New Line, previously starring as Eddie in the record-breaking horror movie It. Grazer is also known for his role on the recently-cancelled CBS sitcom Me, Myself, and I. In the comics, Freddy is severely injured due to a fight between Shazam and Captain Nazi, causing Billy to transfer some of his powers to the young boy. Freddy then becomes the hero known as Shazam Jr., and is taken into Billy's foster family. Freddy's role in Shazam! has been teased for quite some time, with audition tapes for the role making the rounds back in October. While the audition dialogue might not translate completely into the film, it paints Freddy as a "disabled foster kid" with a sense of humor and a love of Superman. In addition to Grazer and Angel, the film will star Zachary Levi, who will play Billy's adult alter-ego. Other cast members will include Mark Strong as Dr. Sivana, and Annabelle: Creation's Grace Fulton in an undisclosed role. Shazam! is set to be released in theaters on April 5th, 2019.